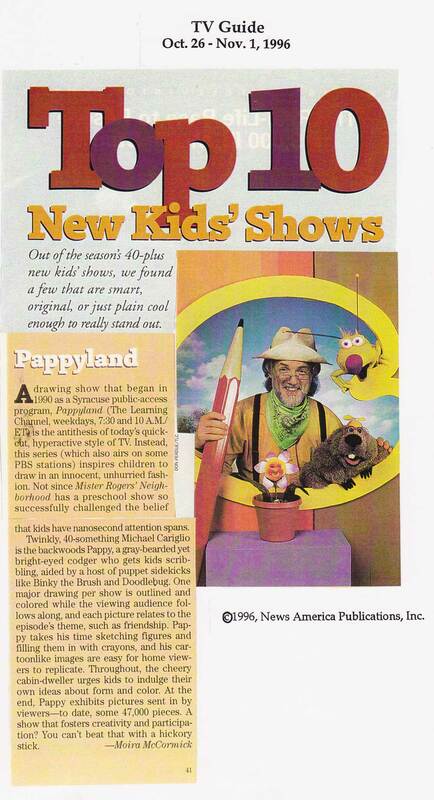 Pappyland was a hit children’s television show. It played on PBS and The Learning Channel for several years (1995-2002). It featured live-action, traditional cel animation, manual and mechanized puppetry, and miniatures and full-scale sets all combined onto the screen at the same time using blue screen and ultimatte special effect techniques. 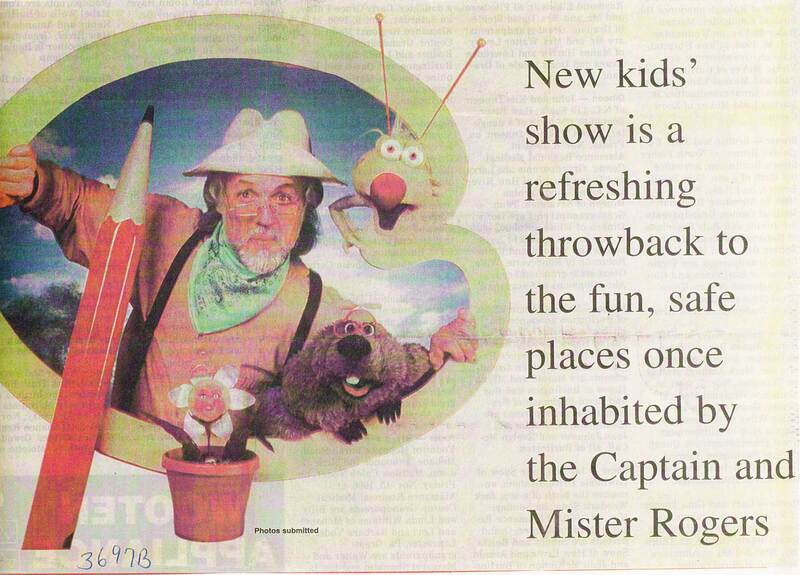 TV Guide named it one of the 10 best shows for kid’s. 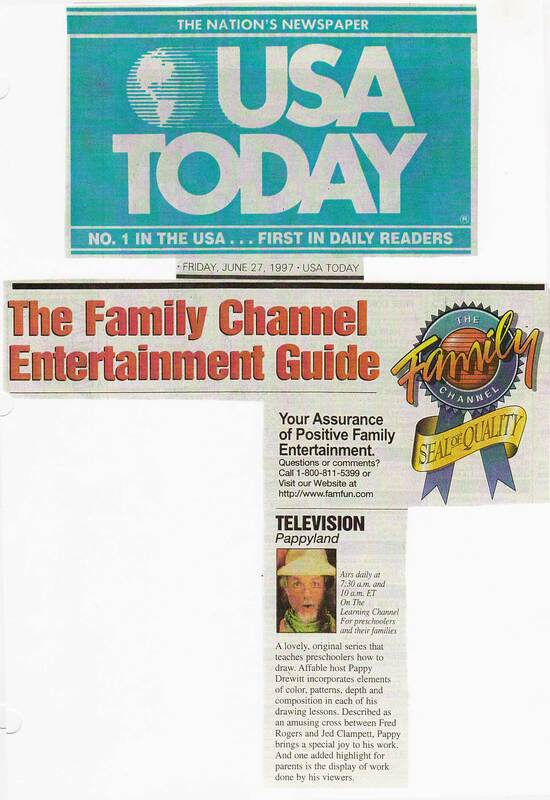 It was highlighted in USA TODAY as recipient of the Family Channel’s Seal of Approval and Hallmark paid much money to acquire the videotape rights at the time. It also shared the Dove Award with Bennett’s Book of Virtues. 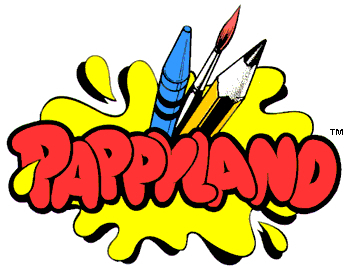 You can still find Pappyland all over the internet including YouTube and Facebook. Like anything on the world wide web, not all of the lore surrounding it can be trusted as accurate, but one thing is undeniable: it was a very popular series that inspired children to use their imaginations, to draw, and to be exposed to some real down-to-earth traditional values like honesty, diligence, faithfulness and more. I will forever be proud of this project co-created by the ever-talented Michael Cariglio and myself. 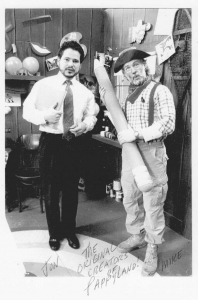 Jon Nappa and Mike Cariglio – The Original Creators of Pappyland! 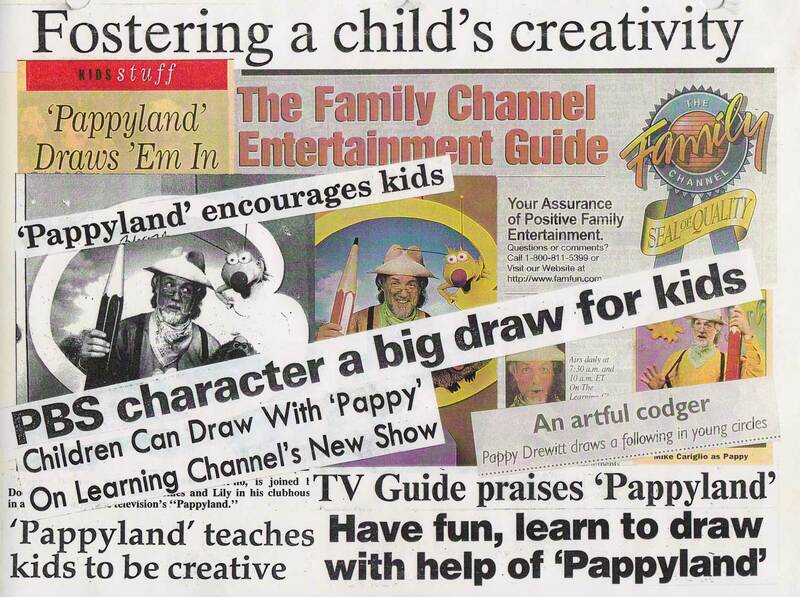 Pappyland was one of the most enjoyable seasons of my creative life. During my brief tenure (middle-to-late 1980s) as the Vice-President and General Manager of Axxess Video Productions in Syracuse, NY, I met an incredibly talented freelance illustrator by the name of Michael Cariglio. Actually, Mike was more than an illustrator; he was an artist who had mastered many forms of creativity. He could draw, paint, build, and sculpt. He could act, too! He had a repertoire of many imitative and cartoon voices. Few people had made me laugh as much as Michael did. More than that, he became one of my all-time best friends and remains at the top of my list of people I truly love. The most fun I’ve ever experienced on any project I’ve ever been a part of occurred during those very special and magical times I spent co-creating with Michael years ago. We used to sit in his detached garage on the north side of Syracuse and work long hours during hot summer days. He’d be building miniature sets or handmade articulating puppets while I sat at my makeshift easel writing scripts and planning shooting schedules. We had formed a company we called Craftsman & Scribe’s Creative Workshop and we had plenty of dreams to fill it with. He was the craftsman; I was the scribe. Did you ever want to paint? Did you ever want to draw? ‘Cause Pappy drew it that way. And speak what’s on their mind. Your pencils, or your crayons. Michael and I made Pappyland with very little money. It was a hard road. I had written the first eight episodes and then created outlines and writer’s guidelines for the remaining eighteen and hired a talented writer, Bennette Tiffault, to write those. I gave her the episodic theme, the special guest character, the episodic lyrics pertaining to the theme, and the existing format to follow and she went to town. Bennette was great and delivered very good scripts. We used some other local artists and song writers to help with animation and musical production at discount prices. I sold all of my furniture to help keep things paid for. I had received an unexpected small inheritance of $10,000 and put every penny into the show. Michael built all of the miniature sets, the main set, the puppets, the costumes (with help from his wife and mine – Sharon and Julianne), and of course, Michael played the starring role because he was Pappy Drew-It. We ended up shooting twenty-six (26) episodes in sixteen (16) days – a feat everyone thought was impossible. But we did it! and it was basically the two of us. After screening the show with some locals, I was provided a desk and a phone at the local PBS station and I personally called as many PBS stations around the country as I could reach. I convinced many to look at our show and within months we had the show airing in over 50 markets and in 8 of the top 10 in the country. 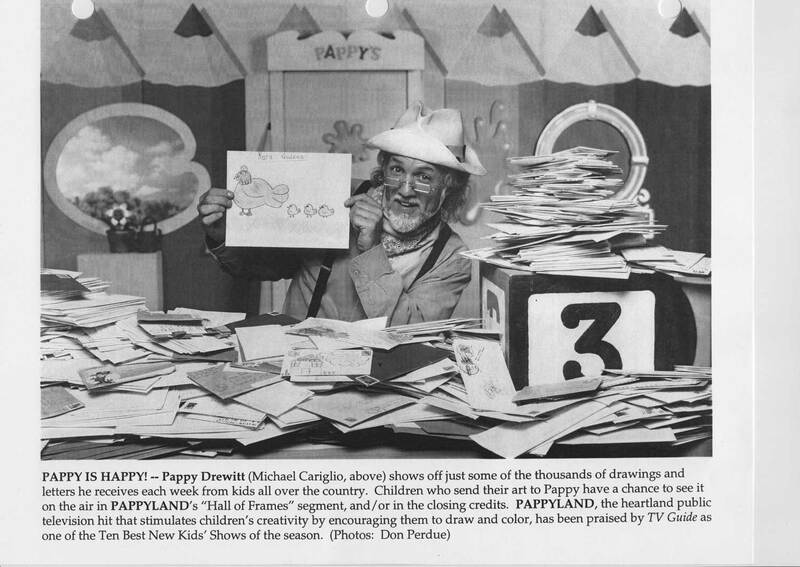 Amazingly, in some markets, Pappyland was beating other top rated kid’s shows like Thomas the Tank Engine and Sesame Street in viewership ratings. It was so promising. Then the fan mail started to come in. The local newspaper did a story on us showing Michael and I sitting in my unfurnished home with thousands and thousands of fan letters piled around us. 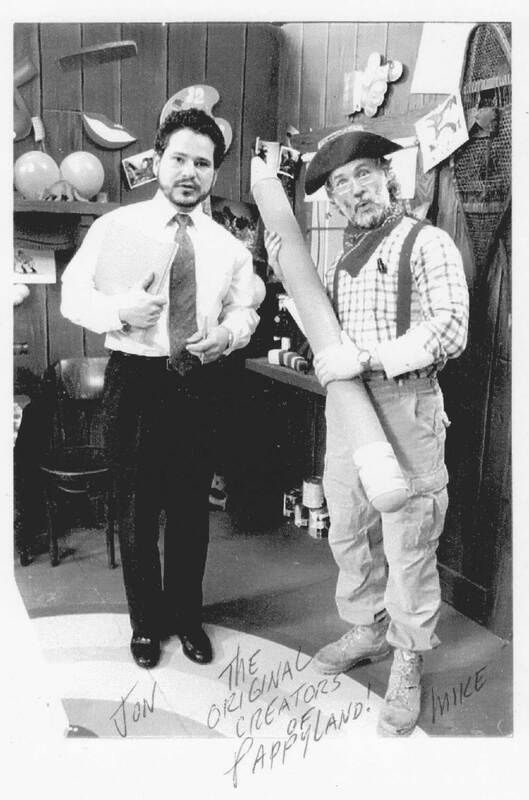 This was the true beginning of Pappyland. As can be the case in these sorts of things, the road that followed those early days was an unexpected one. Other entities came to own and control the franchise and though there were still more Pappyland successes in store for us and some financial rewards – the best part of Pappyland – for me anyways (and Michael, too, he tells me) – was the very beginning. It really was a once-in-a-lifetime experience. Today, Michael and I stay in touch and still make each other laugh and though we interact creatively here and there, we mostly just hang out and laugh and feel grateful for what we accomplished.